In an effort to ensure that all food service establishments from bars and bistros to doughnut shops and diners are in compliance with health regulations, many major cities have introduced letter-graded inspection systems. While the systems are meant to encourage restaurants to comply with health standards, this approach to compliance has drawn criticism, especially from industry insiders, including several top chefs. In New York City, for example, the Department of Health can make unannounced visits to establishments at any time. If an establishment has 14 deficiency points or more, they must be re-inspected within one week. At the time of re-inspection, establishments with 14-27 deficiency points will receive a grade of “B.” If an establishment has 28 or more deficiency points, they will receive a grade of “C.” Once an establishment fails to receive an “A” grade, they can also expect regular inspections until they do. Of course, the impact of receiving a “B” or “C” grade can be devastating. For top-rated restaurants, a “B” grade can result in an immediate shutdown. Even for a small taqueria, however, the results can be devastating. Simple enough for even small children to understand, a low grade nearly always detracts customers and as a result, has a negative impact on business. Unfortunately, reduced profits can make it even more difficult for restaurants to offset the cost of coming into compliance with regulations and more difficult to allocate resources to staff training. From a consumer perspective, there is a strong perception that restaurant grades mean something, but do they? Industry insiders have given New York City’s rating system mixed reviews. On the one hand, industry insiders agree that critical violations are a problem and should never happen (e.g., failure to properly store food, properly cook food or keep facilities in clear and working order at all times). On the other hand, many industry insiders complain that while some rules are simply petty (e.g., an uncovered slice of the lemon behind a bar can result in at least one deficiency point), other rules are never clearly articulated or explained. Some industry insiders also complain that rules often change without the industry being fully consulted or given enough time to bring their establishments into compliance or retrain staff. Indeed, while most owners, chefs and restaurant staff emphasize that they are open to learning from the Department of Health, there’s a widespread perception that the department’s approach to compliance is punitive, at times illogical, and lacks collaboration with the people who know the industry best (restaurant owners, managers, serving staff, cooks and chefs). In other words, the focus appears to be on penalizing establishments rather than on education and creating a sustainable culture of compliance. What’s the answer? 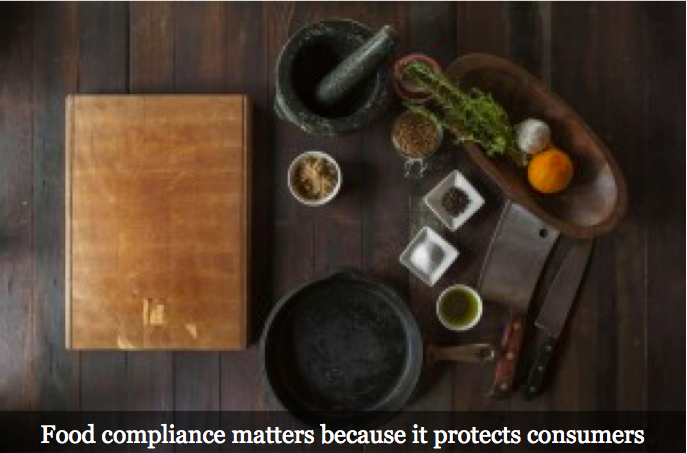 Food compliance matters because it protects consumers; of course, if the goal is to protect consumers, the degree of risk also needs to be weighed (e.g., industry insiders argue that the risk of an uncovered lemon slice is not as great as other risks and therefore should not be the focus). Consult industry insiders to gain a better sense of real risks, the challenges connected to reducing risks, and the timeline needed to address problems. How long should establishments have to come into compliance if under violation? One week or one month? What are the risks to consumers if the timeline for compliance is extended? The only way to answer these questions is to collaborate more closely with the people who are being asked to carry out the changes in question. Finally and most importantly, provide training to help restaurants come into compliance with industry standards and if possible, shift the focus from enforcement to training. Of course, this may mean reallocating resources (e.g., allocating more funds for trainers than inspectors). It may also mean adopting an approach adopted by some school boards where part of the overall grade is based on improvement in specific categories over time. While this may not mean that letter-grade food inspection systems are a problem—indeed, these systems also have many benefits and supporters—it does suggest that they may be more effective by understanding the places where compliance and training intersect (also see our previous post, Aligning Compliance and Training Efforts).